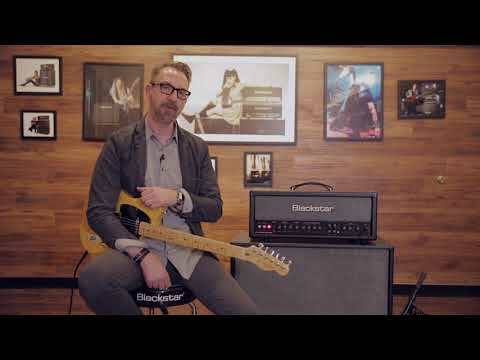 The Blackstar HT Club 40 MK II Guitar Amplifier Combo takes the abilities of this exceptional amp even further. The team at Blackstar went through three years of rigorous R&D to improve upon the already impressive HT Club 40. The result is an exceptional clean channel, richer and more responsive overdrives, footswitchable modes, reduced power for greater efficiency, professional USB recording output, XLR recording DI output, newly design studio-quality reverb, and weight reduction for easier transportation. The Blackstar HT Club 40 delivers exceptional tones thanks to a pair of ECC83s and a pair of EL34s, a winning combination that creates immense power. There are two footswitchable channels (Clean and Overdrive) for you to play with, each with two footswitchable voices making it four in total. The clean channel voices are based on a classic American circuit, and a classic British circuit. By using the Voice switch to flick between each voice, you can instantly tap into a clean, bright and tight output with a meaty low-end response, or a sweet chime coupled with a looser low-end. Not only that, but with Bass and Treble controls on hand, you can adjust and attenuate the voice to suit your wishes. The Overdrive channel voices are modelled on the award-winning HT Venue Series, encouraging high gain outputs that are infused with a natural sounding response. As with the clean channel, the voices are footswitchable, and controllable using the Bass and Treble controls. Live performances can be as dynamic as you wish thanks to the easy to use switching setup. The HT Club 40 MKII is equipped with Blackstar's patented ISF tone-shaping control, which offers a US-type amp response at one end, and a UK-type amp response at the other - with an infinite number of possibilities between the two! The result is an easier and more efficient way of finding that elusive tone that you've been seeking. The HT Club 40 MK II has a redesigned digital reverb circuit, which features switchable Dark/Light settings. The Dark setting is based on a room reverb, whilst the Light setting is based on a plate reverb. Whether you're playing in a small venue and want to create a larger impression, or want to dial it back and keep your tone tight, the reverb effect gives you the ability to inject depth into your tone. The addition of an Effects Loop means that you can input outboard effects via send and return connections to expand your tone shaping options. The Blackstar HT-Club 40 MK II is equipped with a range of connectivity options to meet your demands. When laying down tracks in the studio or on the fly, the professional USB audio connection allows you to output up to four channels of the guitar signal, dry, preamp out, and stereo emulated out into your DAW of choice. There are additional outputs that includes a pair of speaker emulated outputs (XLR and stereo jack) with 1x12 and 4x12 options. When performing live, you have 1x16/1x8 or 2x16 Ohm options for connecting to external speaker cabs. However, at the other end of the spectrum, you can reduce the power output to 10% of the total output to gain full wattage power and tones at a significantly lower volume output - perfect for laying down chops in the studio or practising at home. If you fancy going one step further when practising, you can output to a pair of headphones. Whether you're hitting the stage or taking to the studio, Blackstar have thought of everything with the HT Club 40, and to play one is to love one.